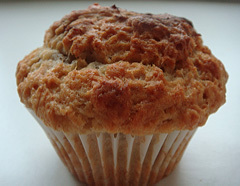 Light, fluffy, tasty muffins to cook, offer and enjoy. Includes ingredients listing and method explaining how to make them. Includes suggestions for variations in the recipe. Measure wet ingredients into measuring jug and mix. Mix dry ingredients in big bowl. Pour wet ingredients into dry and stir until all flour has been incorporated. Don’t over stir. It will be a thick, sticky mixture. Add in any fruit you are using, or 1 tsp vanilla extract. Spoon into 12 muffin cases and bake for 20 – 25 minutes, 180c, gas 4. You can chop the fruit into small pieces, grate, or use left over pulp from making cordials.